Grandfather’s are awesome because they understand the world in a much more direct and uncluttered way. They don’t care for text messages, online shopping or virtual waiting rooms. They all come from a time whereby, if you needed something, you went out and took it! 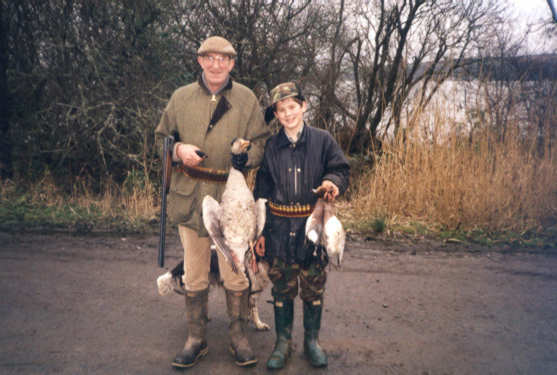 It is for this reason that going hunting with your grandfather can be a profound experience. Discovering tracks, following a trail, killing and cleaning an animal. These are all things that come naturally to your grandfather. While you’re out in the bush, he will regale you with tales of times gone by, each one poignantly finishing with the perfect moral. You can’t learn this stuff in school. You don’t necessarily have to go hunting for deer or quail, however. Simply accompanying him to the hardware store as he hunts for the perfect tool to finish the project he’s working on will be an education. Note how he surveys his environment using instincts forged over years of experiences, having witnessed firsthand the most rapid and monumental era of change the world has ever known. See how, at first, he mistrusts the sales staff, but then warms to them as he realizes they share a similar obsession for fine craftsmanship and sturdy instruments. And, as he walks up to the register, feel that sense of empowerment and pride as he pays with money that he may well have earned 30 years ago. When you go hunting with your grandfather, you’re not so much seeking as you are conquering! This entry was posted on May 11, 2010 at 9:08 pm and is filed under sports. You can follow any responses to this entry through the RSS 2.0 feed. You can leave a response, or trackback from your own site.